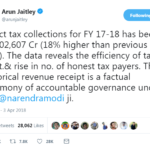 Apologists for Prime Minister Modi’s Demonetisation policy are now claiming it led to a big rise in direct tax revenues for Financial Year (FY) 2016-17. 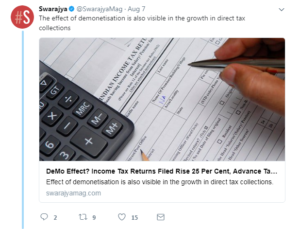 See, for instance this from Swarajya: Does this stack up? The obvious logical flaw in this line of reasoning is the well-known ‘Post hoc ergo propter hoc’ fallacy. This is a Latin phrase that means, ‘After this, therefore because of this’. The logical fallacy lies in the assumption that X caused Y because Y happened some time after X. It is possible that Y happened despite X, not necessarily because of X. Indeed if X had not happened then it is at least conceivable that something even better than Y might have resulted; we’ll never know. But without further analysis the conclusion is always suspect that X directly or indirectly caused Y. How do we judge the claimed rise in 2016-17 tax revenues? Is it something we might have observed anyway? Regardless of what happened on Nov 8? Luckily for us the tax revenues in each year are part of a time-series data set published by the Government. The full report is here: Table 1.1 of this report shows the tax revenues for each year since 2000-01. The first few rows of this table are shown here. I have examined the trend in tax revenues by drawing trend charts. 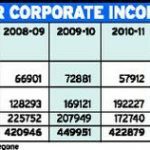 The following charts show the trend in direct tax revenues for Personal tax and for Corporate tax. Tax Collection 2000-01 to 2016-17 Personal Income Tax Corporation tax These charts clearly show that the trend over nearly 2 decades has been one of steady year-on-year growth in direct tax revenues. This is of course to be expected. 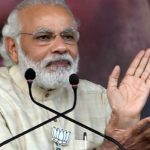 India’s GDP has grown over this period, economic activity has expanded, wages have risen and more people are tax payers – albeit the vast majority of people are too poor to be liable for income tax. In 2016-17 the total number of direct tax assessees (including companies, partnerships, trusts, individual, and 6 other categories) stood at 62.7 million in a country of 1,250 million people. The key point is this: the growth in tax revenues in 2016-17 is just trend growth; it’s part of the pattern that we saw for the last decade. At least that much growth would almost certainly have happened even if the PM had not declared 86% of the currency to be no more than worthless scraps of paper. 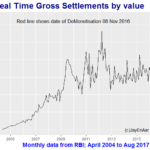 Arguably it might have been higher if demonetisation had not battered the economy as hard as in fact it did; we’ll never know. But to claim that the rise this past year is one of the benefits of demonetisation is to clutch at straws. It is a deliberate misuse of the official statistics; It is a cynical attempt to hoodwink the public into thinking that the sacrifices they willingly made in the months after Nov 2016 was worth it. The least the Government can do is not insult their intelligence by claiming benefits on a fallacious and specious use of statistics. Public health physician, Commentator and blogger on public policy, Statistics and Data science enthusiast, Liberal.